English in southern England (also, rarely, Southern English English, or in the UK, simply, Southern English) is the collective set of different dialects and accents of the English spoken in southern England. South East England and the Home Counties (the counties bordering London) tend to reflect the interface between the London region and other regional accents. Affluent districts are associated with a modified Received Pronunciation (RP) accent, reflecting their traditional popularity with upper middle and upper-class residents which has spread throughout more social classes broadly in rural areas with commuting access to London. Less affluent areas have traditionally mainstream London accents (that is, variants of the Estuary English accent) that grade into southern rural outside urban areas. Wells notes traditional aspects of rural south-eastern speech as lengthened [æ:] in trap words and use of [eɪ] or [ɛʊ] in mouth words. Accents are nonrhotic, that is, /r/ (phonetically [ɹ]) occurs only before vowels. diphthongal realization of /ɔː/ in open syllables, for example bore [ˈbɔə], paw [ˈpʰɔə] versus a monophthongal realization in closed syllables, for example board [ˈboːd], pause [ˈpʰoːz]. But the diphthong is retained before inflectional endings, so that board and pause often contrast with bored [ˈbɔəd] and paws [ˈpʰɔəz]. lengthening of /æ/ in words such as man, sad, bag, hand (cf. can, had, lad): split of /æ/ into two phonemes /æ/ and /æː/. See bad–lad split. an allophone of /əʊ/ before "dark L" ([ɫ]), namely [ɒʊ], for example whole [ˈhɒʊɫ] versus holy [ˈhəʊli]. But the [ɒʊ] is retained when the addition of a suffix turns the "dark L" clear, so that wholly [ˈhɒʊli] can contrast with holy. It is also common to hear young Londoners drop "(to) the" from sentences related to going places (such as: Do you want to go cinema?/Do you want to go West End?). Sloane-speak or Sloaney-speech is spoken by the upper middle and upper classes, ultralocalised in Inner South-West and West London by a range of inhabitants of the very expensive private housing in and around Sloane Street and Sloane Square, Chelsea, Mayfair and alongside Marylebone High Street. The speakers of Sloaney are sometimes defined as Sloane Rangers. Levelling aspects of the speech of the young aristocracy were heightened in the early 1980s by the 'Princess Diana' accent and effect yet drew upon public school and historic vocabulary to form a distinct Sloane-speak of the young and wealthy soon dubbed 'Sloane Rangers'. Here aristocrats' clipped Received Pronunciation was modified in this particular speech community as the young upper and upper-middle classes, like Diana and contemporaries, increasingly settled as singles in the 'muesli belt' round Sloane Square on the border of Belgravia and Chelsea, Chelsea's King's Road into Fulham and even in expensive parts of Putney, Richmond, London, Wandsworth and Battersea. Sloanies followed the 1960s fashion boom of King's Road and became lesser cultural icons for a time in fashion, as well as seeking out idiosyncratic cultural pursuits and language. Features, whether affected or throwback to particular aristocratic shorthands include 'jah' for yes; "(s)he's rairly, rairly (really, really) nice', or shortened ('Nick's' for Harvey Nichols; 'Rods' for Harrods; 'Fred's' for Fortnum and Mason's). Hyperbole was for a period rife ('frightfully', 'ghastly', 'appalling', 'thanks awfully'), but subject to influences from more demotic speech of the capital, particularly towards its fringes." Reflecting national upper class moves towards slightly less formal pronunciation, or indeed the middle-dialect influence of Sloane-speak, end-of-sentence glottal stop and final-t /d/ sounds came into the speech of younger Royalty: for instance in the speech of Diana and Prince Edward ('/ðɪərz.ə.lɒd.əboʊtiʔ/ There's a lot about it); and vocoids for "l" as in miʉ[ɫ]k; all juxtaposed against borrowed vocabulary from opposing dialects such as 'bog' (toilet) and 'yonks' (a long time). "Sloane-speak has grown edgier. Nancy Mitford's vocabulary was updated last year by a wealth of new words compiled into a dictionary by Olivia Stewart-Liberty and Peter York (author of the original Sloane Ranger Handbook). But the past few months have yielded telling additions: "disrevelled" refers to a Sloane's appearance after a heavy night at Boujis; "dorleybowl" is a bad haircut (in frequent usage, as you can imagine); "squippy" is the perpetual state of the Sloane (it means "hyperactive"). Then there's "jollop" (to go out and enjoy oneself) and "floordrobe", the place young Sloanes choose to store their clothes – i.e., on the floor. Oddly, there don't seem to be any jolly, japeish terms for "the workplace", "grocery shopping" and "bill paying"". Diphthong shift of [iː] to [əi] (for example beet [bəiʔ]), [eɪ] to [aɪ] (for example bait [baɪʔ]), [aɪ] to [ɒɪ] (for example bite [bɒɪʔ]), and [ɔɪ] to [oɪ] (for example, boy [boɪ]. Multicultural London English (abbreviated MLE), colloquially called Blockney or Jafaican, is a dialect(and/or sociolect) of English that emerged in the late 20th century. It is spoken mainly by youths in inner London. The speech of Jamaicans, or children of Jamaican parents, in London shows interesting combinations of the Jamaican accent with the London accent. For example, in Jamaican English, /θ/ is replaced by [t], for example both /boːt/. In London, word-final /t/ is realised as [ʔ], as mentioned above. In Jamaican-London speech, glottalization of /t/ applies also to /t/ from /θ/, for example both of them [bʌʊʔ ə dem]. Hypercorrections like [fʊθ] for foot are also heard from Jamaicans. John C. Wells's dissertation, Jamaican pronunciation in London, was published by the Philological Society in 1973. Essex, is usually associated with Estuary English, mainly in urban areas receiving an influx of East London migrants. 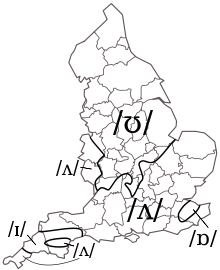 The non-urban Essex accent, generally found in the north of the county, is more closely related to those of East Anglia. Residents of places within Essex such as Basildon, Billericay and Grays are more likely to have an accent similar to the traditional 'Cockney' accent, due to the proximity to East London and East End migration to these areas since WWII. Estuary English is the name given to an accent (or group of accents) that may informally be considered a compromise between Cockney and RP. It retains some aspects of Cockney, such as the vocalisation of [ɫ] (dark L) to [ɯ], and yod-coalescence in stressed syllables (for example, duty [dʒʉːʔi]) and replacement of [t] with [ʔ] (the glottal stop) in weak positions, or occasionally with d). The east Herts accent traditionally spoken is akin to a native central/north Essex rural accent. The largest towns in particular have the diverse sociolect variants of Received Pronunciation and Estuary English as seen in London, with smaller settlements tending towards the traditional dialects or variants of RP. West Herts and Buckinghamshire have r-coloured vowels, for instance, here the established dialects make a distinction between the words farther and father /fɑːrð/ər and /fɑːðər/. However again in larger settlements are strong influences from London's Estuary English, thanks to the influx of post-World War II migrants from across London. Hampshire is often missed in dialect definitions and placed on borderlines between South East and West England. It is thought that Hampshire is generally a posh county using a Queen's English accent, however, use of Estuary English accent is also very common in Hampshire. Contrary to popular belief, it has been found that very few people from Hampshire use a West Country dialect or accent. Due to urbanization, the numbers have steadily decreased and it can be argued that Hampshire is a borderline county moving East, linguistically. The traditional Portsmouth dialect (affectionately known as the Pompey dialect, and less favourably as Pompey Slang) is an oddity and somewhat an isolate. It stands well apart both structurally and phonetically from all other local English varieties around it. The traditional origin story is that the Dockyards attracted an influx of East Londoners at the turn of the 20th century and the accent is based in "Dockyard slang". Though structurally it is based around an East London model, it has retained a lot of traditional Hampshire features. Whilst it follows the consonant rules of Estuary English closely, the vowel sounds are quire different. The dialect is not a recent phenomenon, and can be heard in the speech of local people in their nineties. The surrounding accents geographically are quite different, and few contain as many of the "Estuary-isms" found in the Pompey dialect and some of those may actually originate from Portsmouth, rather than Estuary English. As with neighbouring Hertfordshire, Bedfordshire has a variety of accents. In the Luton/Dunstable Urban Area, the accent is similar to a London accent, and it is often mistaken as one. This is because of the overflow of Londoners and their subsequent generations in the area. The 'Lutonian' accent is not as strong as an accent from Essex. The main difference between Lutonian and other Southern English accents is the pronunciation of the letter 'T'. A good example is the pronunciation of the word "Luton": to most natives, it is said like "Lu'n". This difference was played upon in the Campari advert featuring Lorraine Chase. In Mid Bedfordshire the more traditional accent of the area is still held. Especially by those of an older generation, or in very remote areas. While in North Bedfordshire especially near the border with Northamptonshire it can be argued that the dialect is one which sounds more like East Midlands English, Bedford itself is linguistically diverse, reflecting the more varied demographics of the town (compared with the surrounding villages). A typical Bedford accent is more similar to a Londonian Luton or Dunstable accent, due largely to movement of people from these places to Bedford. Accents today are a cross between Estuary English and Received Pronunciation which both evolve over time and are becoming significantly more similar; where towards the former, accents have been strongly influenced by proximity to towns in the London Gateway involved in heavy trades, fishing and repairs and merchant sides of the Royal Navy, which was concentrated in Greenwich and Chatham. This corresponds to the name of the dialect which refers to the Thames Estuary. 'H dropping' is in general rare, as in the other Home Counties, but 't dropping' or substitution with a weaker vowel is common. However of particular note, one vowel usage is unique to West Kent which is the [ɒ] realization of the /ʌ/ phoneme..
A traditional Surrey accent again has r-coloured vowels while being entirely nonrhotic. Estuary English is common throughout the county, particularly in the northern areas bordering on London, although many large settlements further south into Surrey, such as Guildford and Woking, share in variants of estuary English. Furthest north into Surrey is the borough of Spelthorne, where the accent is indistinguishable (as formerly part of Middlesex) from the London accent due to it sharing borders with the London boroughs of Hounslow, Richmond-upon-Thames and Hillingdon. Jafaican, also known as Tikkiny or less commonly "Hood-Chat" is part accent, part dialect, from around the mid-1990s, and influenced not only by British black urban culture, but by rap music. This variant is used by the youth of all races as a 'street' patois, with clear African-American/American English influences (such as the greeting "Yo! "), but also Caribbean patterns such as "aks" (rather than "ask"). The dialect is used mainly by young people, regardless of racial background. It can be heard in many parts of England, but especially around London. This family of similar strongly rhotic accents, now perceived as rural, originally extended across much of southern England south of the broad A isogloss, but they are now most often found west of a line roughly from Shropshire via Oxfordshire. Their shared characteristics have been caricatured as Mummerset. They persist most strongly in areas that remain largely rural with a largely indigenous population, particularly the West Country. In many other areas they are declining because of RP and Estuary accents moving to the area; for instance, strong Isle of Wight accents tend to be more prevalent in older speakers. The diphthong /aɪ/ (as in price) realised as [ʌɪ] or [ɔɪ], sounding more like the diphthong in Received Pronunciation choice. The diphthong /aʊ/ (as in mouth) realised as [ɛʊ], with a starting point close to the vowel in Received Pronunciation dress. The vowel /ɒ/ (as in lot) realised as an unrounded vowel [ɑ], as in many forms of American English. In traditional West Country accents, the voiceless fricatives /s/, /f/, /θ/, /ʃ/ (as in sat, farm, think, shed respectively) are often voiced to [z], [v], [ð], [ʒ], giving pronunciations like "Zummerzet" for Somerset, "varm" for farm, "zhure" for sure, etc. In the Bristol area a vowel at the end of a word is often followed by an intrusive dark l, [ɫ]. Hence the old joke about the three Bristolian sisters Evil, Idle, and Normal (written Eva, Ida, and Norma). L is pronounced darkly where it is present, too, which means that in Bristolian rendering, 'idea' and 'ideal' are homophones. In traditional Southern rural accents, the voiceless fricatives /s/, /f/, /θ/, /ʃ/ always remain voiceless, which is the main difference from West Country accents. Yod-dropping after all consonants: beautiful may be pronounced [ˈbʉːʔɪfəl], often represented as "bootiful" or "bewtiful", huge as [ˈhʉːdʒ], and so on. Absence of the long mid merger between Early Modern English /oː/ (as in toe, moan, road, boat) and /ɔʊ/ (as in tow, mown, rowed). The vowel of toe, moan, road, boat may be realised as [ʊu], so that boat may sound to outsiders like boot. Glottal stop frequent for /t/. The diphthong /aɪ/ (as in price) realised as [ɔɪ], sounding very much like the diphthong in Received Pronunciation choice. Merger of the vowels of near and square (RP /ɪə/ and /ɛə/), making chair and cheer homophones. East Anglian accents are generally non-rhotic. There are differences between and even within areas of East Anglia: the Norwich accent has distinguishing aspects from the Norfolk dialect that surrounds it – chiefly in the vowel sounds. The accents of Suffolk and Cambridgeshire are different from the Norfolk accent. 1 2 3 Wells, John C. (1982). Accents of English. Cambridge: Cambridge University Press. pp. 400–70. ISBN 0-521-24225-8. ↑ John C. Wells Jamaican pronunciation in London The Philological Society (1973). ↑ "Portsmouth Society - Pompey as she is spoke (Pompeyspeak) - readers' comments". ↑ "Do You Speak Pompey?". ↑ "School STAFF to get English lessons so bad slang habits don't hamper pupils". Mail Online. 3 October 2010.